"Congress created and expanded the Direct Loan Program with the goal of simplifying the delivery of student loans to borrowers, eliminating borrower confusion, avoiding unnecessary costs to taxpayers, and creating a more streamlined student loan program," the memo reads. "Recently, several States have enacted regulatory regimes or applied existing State consumer protection statutes that undermine these goals." The memo, which was first reported by Bloomberg, has not been officially released; it marks the latest move by the Trump administration to align itself with debt collectors over the nation's 44 million student loan borrowers. In August, the Education Department announced it would also stop collaborating with the Consumer Financial Protection Bureau in its oversight of loan servicers. That's after the CFPB had put the student loan industry on notice by suing the nation's largest servicer, Navient. The federal watchdog accused Navient of mismanaging borrower payments and steering struggling borrowers into costly plans. The company denied those charges. With the CFPB increasingly sidelined, states argue the job of policing loan servicers has fallen to them. "This is a radical change," says Christopher Peterson, a law professor at the University of Utah and former enforcement attorney at the CFPB. In the past, he notes, the Department of Education had worked with federal and state regulators to protect student borrowers and regulate student lenders. But under the Trump administration and DeVos, the department ended an information-sharing arrangement with the CFPB — making it harder for the bureau to police the industry, Peterson says. "And now we're finding out that the Trump administration is also going to attempt to shut down all oversight and regulation by state governments," he says. "It appears that the Trump administration doesn't want anyone to focus on whether the debt collectors are treating student loan borrowers fairly." States have adopted a wide range of requirements to constrain servicers. States may impose additional fees, deadlines, transparency requirements and limits on how far companies can go to collect repayment. Many states have also created a student loan ombudsman to investigate borrower complaints. 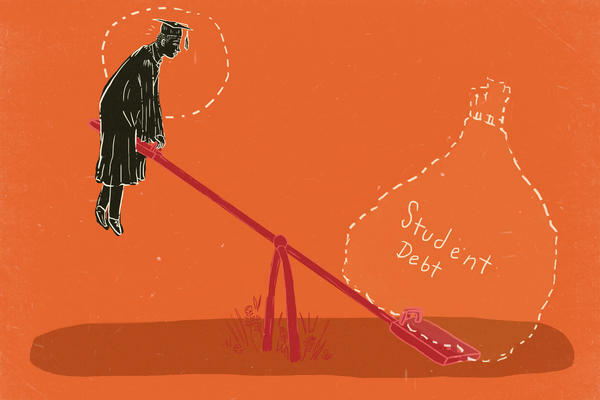 Illinois passed a student loan bill of rights. The newly obtained memo, if entered into the Federal Register, would not have the force of law. However, it would put the federal government on the side of complaints by servicers that states require too much of them and that the servicers can't possibly comply with 50 different sets of rules. Last summer, the Education Finance Council and the National Council of Higher Education Resources — two groups that represent the interests of student loan companies — implored DeVos to weigh in on this increasingly bitter fight between states and loan servicers. "I am writing to express my concern with the growing tendency of state entities to seek to impose state-level laws and regulations on student loan servicers," wrote the EFC's president, Debra Chromy. "If left unchecked, these state efforts will continue to add an unnecessary web of regulations which are both duplicative of and potentially contradictory to existing federal regulations and policies." In the new memo, the department agrees, arguing that state efforts to police servicers are pre-empted by federal law, namely the Higher Education Act. These state-led efforts to rein in servicers ultimately hurt taxpayers, the memo argues. The Justice Department offered a similar argument when it recently weighed in on a Massachusetts lawsuit against a student loan servicer. And, late last year, House Republicans attempted to pass legal protections for servicers from tougher state laws in a rewrite of the Higher Education Act. But this fight does not always follow traditional political lines. A bipartisan group of 26 state attorneys general — including reliably conservative Montana, Tennessee, Kansas and Texas — wrote to DeVos in October, urging her to "reject an ongoing campaign by student loan servicers and debt collectors to secure immunity for themselves from state-level oversight and enforcement." "There is no principled reason for the Department to weaken or box out states just as our combined federal-state efforts against abusive practices in the student loan servicing industry have begun to bear fruit," the attorneys general wrote. "Nor is there any justification to seek to interfere with the traditional police power of states to protect their own residents from abuses in the marketplace." Massachusetts Attorney General Maura Healey told NPR: "What this memo signals is that they want to stop states like Massachusetts and my office from holding companies accountable for ripping off students with predatory loan servicing practices." Pro-consumer groups also expressed concern about the proposal. "Once again, the Department of Education has revealed that it is on the side of companies instead of standing by borrowers and their families," Whitney Barkley-Denney, a policy counsel with the Center for Responsible Lending, said in a statement. "Acting at the behest of servicers and their lobbyists denies an opportunity for comment by the 44 million Americans who share the burden of a still-growing $1.4 trillion in student loan debt." The Trump administration is considering a plan to block states from policing the trillion-dollar federal student loan industry. That's according to a memo obtained by NPR. It has not been made public yet. It comes from Betsy DeVos, head of the U.S. Education Department. NPR's Chris Arnold reports. MAURA HEALEY: What this memo signals is that they want to stop states like Massachusetts from holding companies accountable for ripping off students with predatory loan servicing practices. ARNOLD: Healey is among state AGs who filed lawsuits against the debt collectors. She says there are all kinds of abuses going on and not just involving loans to students at traditional colleges. HEALEY: They work with some of these for-profit predatory schools frankly through high sales pressure tactics, get people to sign up for courses, for schools, take on boatloads of debt and then leave them high and dry with worthless degrees. ARNOLD: State and federal investigators have found that student loan debt collectors also mismanaged the payments that people make. So for example, a public schoolteacher might qualify to get a big chunk of his or her loan forgiven because they're doing public service work. But that doesn't happen, and the schoolteacher has to keep paying off the loan. CHRISTOPHER PETERSON: They had tens of thousands of dollars of loans that should have been forgiven. ARNOLD: Christopher Peterson is a former enforcement attorney at the Consumer Financial Protection Bureau. That's the federal regulator for student loans. He says Trump's Education Department no longer works closely with regulators, and that's a radical change. The industry has been lobbying for federal law to apply to federal student loans, which are the bulk of the student loans. Debra Chromy is the president of the Education Finance Council, which represents companies that manage loans and collect payments. DEBRA CHROMY: We're just concerned that we may end up with this patchwork of 50 different state laws. Everyone is a little bit different. These are federal student loans. Why not have that all managed at the federal level? ARNOLD: But Peterson says the Trump administration has already moved to thwart federal oversight of the industry. It recently ended an information sharing arrangement with his old agency, the Consumer Protection Bureau. He says that makes it harder for the CFPB to police student loans. And now there's this internal document which was first reported by Bloomberg. PETERSON: Now we're finding out that the Trump administration is also going to attempt to shut down all oversight and regulation by state governments. It appears that the Trump administration doesn't want anyone to focus on whether or not the debt collectors are treating student loan borrowers fairly. ARNOLD: The Department of Education declined to comment. Twenty-six state AGs including some Republicans have already sent a letter to Education secretary DeVos urging her not to move to, quote, "interfere with the traditional police power of states to protect their own residents." If DeVos moves ahead anyway and the draft becomes official policy, it would serve as guidance, but it wouldn't be the last word. State AGs say they'll still bring their lawsuits, and judges could still side with them. Chris Arnold, NPR News. (SOUNDBITE OF LOCAL NATIVES SONG, "BLACK BALLOONS") Transcript provided by NPR, Copyright NPR.